This workshop is open to members and non-members. Please phone the studio (892-2701) on Wed eve or Sun morning to put your name down or reply to this blog posting. A few details, including costs, are grant dependant, but we will update this post when we know more information. The information below was provided by Liz Demerson. Before pottery was in Liz Demerson's life, she received a Bachelor of Arts from the University of New Brunswick in 1998 and a Master of Arts from Concordia University in 2001; both in Socio-Cultural Anthropology. Liz Demerson graduated from the New Brunswick College of Craft and Design in 2003 with a Diploma in Fine Craft. She has been creating pottery in her own studio and worked as technician and teaching assistant at NBCCD for four subsequent years. Juried into the New Brunswick Crafts Council in 2004, she began attending craft sales in New Brunswick and Nova Scotia. 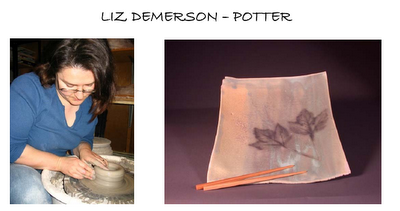 In 2005 she began to supply pottery for the wholesale market through attending the Atlantic Craft Trade Show. In 2006, she attended the One of A Kind sale in Toronto. She ran a pottery studio and craft store at Kings Landing Historical Settlement in 2005 and 2006. Liz has been teaching pottery since graduating from the College as a teaching assistant, and began to teach privately in 2005. After obtaining a teaching degree from the University of New Brunswick in 2009, and having a baby in 2008, she has been teaching Art in the public school system as a substitute, and has since begun teaching pottery at the NBCCD. Even while working on her teaching degree, substituting and raising her daughter, pottery has always been on Liz's agenda and has continued to sell her work at craft sales and to a few wholesalers around the Martimes. Functional ware has always been Liz's main interest. She loves the thought that the pieces she creates are used daily as a favourite mug or bowl. Her influences are mostly from contemporary sources; high fired porcelain pieces and minimalism in decorating. She uses both thrown and handbuilding techniques to create two distinct lines. Recently she has begun to experiment in combining the two techniques to create larger more dramatic forms. Friday Evening - 2 hours: Introduction, slide show and discussion of my work and influences.